Although I’m sure you all know what stand up comedy is, I’ll give a word or two about it for those who don’t. It’s a comedy style show in which a comedian stands in front of the audience, speaking directly to them. These kind of performances are very popular lately, mostly because they are funny and have the ability to relax people in the audience. Nothing beats stress like a good laugh, I think you all agree with me! The shows are filmed with the best equipment like HD cameras and microphones to deliver you the best stand up experience! Some of the comedy clubs, or even comedians, use super high technologies like drones and drone cameras to film the shows. That way it’s possible to capture every single piece of emotion on the comedian’s face while performing. It’s also nice to be able to capture the audience’s faces and face expressions since that’s the best part of every show. You have to believe me, since I was a part of so many so far! As you already know, apart from live performances as show, stand up is widely distributed outside of the pubs’ walls. It’s available on television, internet, youtube, CDs, DVDs. There are even stand up life streams today. And the best thing is: it’s getting more and more popular. We’re also witnessing an era without borders and censorship: stan dup comedians are free to talk about almost anyone and anything on the stage. They often talk about the burning existential problems wrapped in dirty jokes and puns. 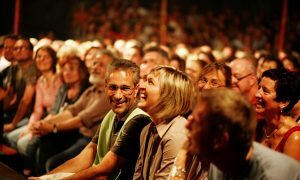 If you’re interested in becoming a comedian, a lot of bars and pubs offer the so-called “Open Mic nights” where anyone can perform in front of the live audience. Maybe you’re the new Timur Rodriguez, who knows? Give it a try! It is believed that Stand up comedy originates in classic Parrhesia, somewhere 400 BC. Then, it was a show where people (comedians) are able to tell the reality without censorship. It becomes widely accepted and popular in the United Kingdom in 18th and 19th century. 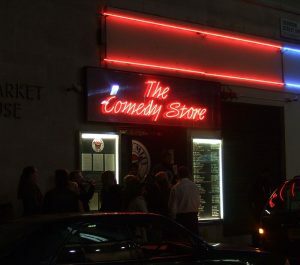 In 1979 Comedy Store opened, where many popular comedians like Dawn French, Jennifer Saunders, Craig Ferguson and many more started their careers. It was then when the comedy circuit has expanded and has left the UK borders and became planetary popular way of entertainment. Even today, the Comedy Store stands still in Soho, London and is still one of the most iconic stand up comedy clubs in the whole world. If you are a stand up comedy lover, make sure to visit when in London. It’s still very popular and, I must warn you, very crowded. Mostly during weekends, since it’s the perfect time to get out and have a good laugh after the week is over. No better way to put yourself in weekend- mood than stand up. If you love stand up comedy, you’ve come to the right place. Here, we do our best to deliver the best comedy experience to our dear readers. We are very happy to share the news about the upcoming shows with you, as well as some high quality stand up content from around the world. Laughter has no boundaries! I just hope you will find our blog useful and that you will feel free to contribute if you think you are capable of doing so. Check out our event calendar, our videos and photos from the past shows and stand up nights! I promise you won’t regret clicking on our page. Don’t forget to check it out regularly since we are adding fresh content every day. You can go to “About Us” section and find out more. Feel free to use the Contact form to get in touch. We check our inbox regularly!